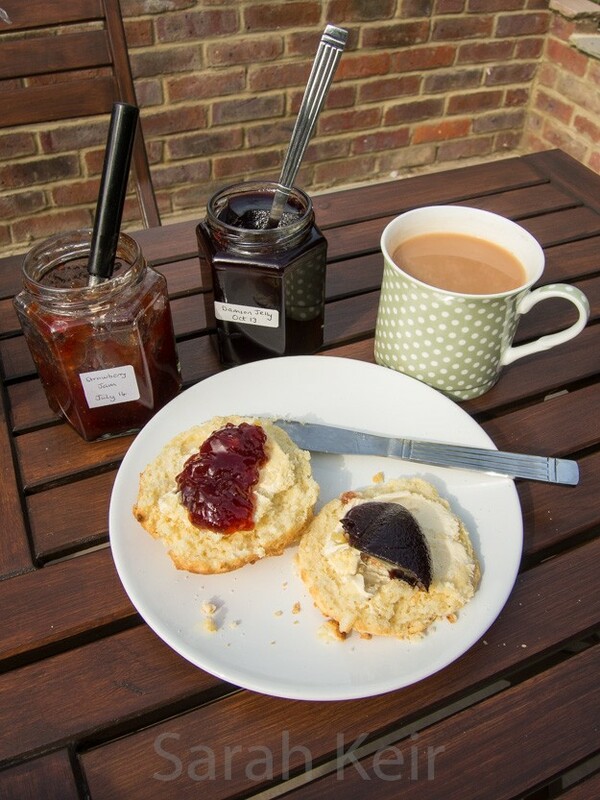 Scones are perhaps too plain for today’s tastes but no afternoon tea is complete without them. 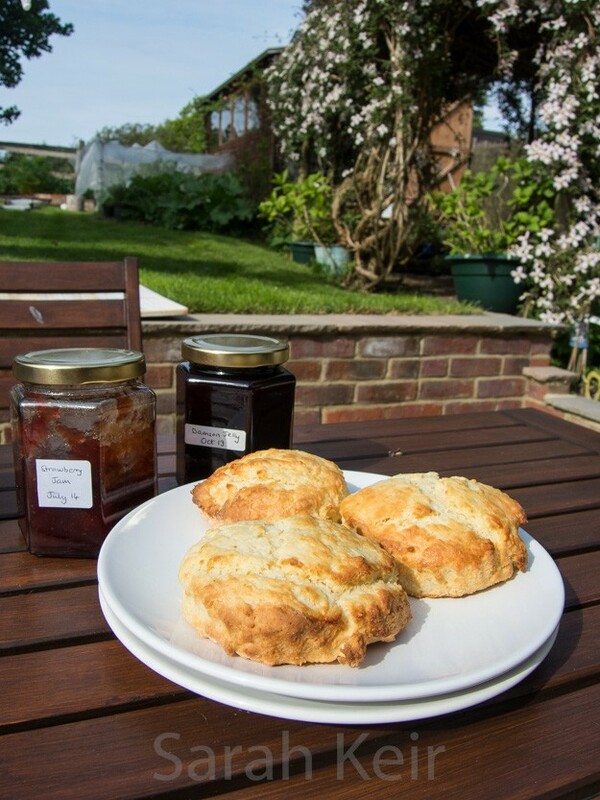 Some (my husband) consider them a vehicle for cream and jam but a properly made scone should be a delight on its own, perhaps with some fresh butter. A slightly crisp crust outside and fluffy but not cakey or spongy interior. They need to rise well and have some colour on the top. Not as easy as it sounds; just look at my rather flat offerings. My excuse is I knocked them together in a few minutes between gardening and painting the back of the house at the weekend. Not much of an excuse but I’m sorry. There are a few trick and tips to help your scones turn out better. My main problem was that I patted the dough too thin before I realised and didn’t have the time to rework it. Do not use recipes that add egg; the scones turn out too cakey. Work the mixture as little as possible, leave large flakes of butter in the dough, pat into correct thickness (2cm) rather than using a rolling pin and do not twist the cutter when stamping out. Finally, clotted cream and homemade jam are essential. Preheat the oven to 220 ºC/200 ºC fan. Lightly grease a baking sheet with spare butter. Sift the flour, salt and baking powder into a large bowl and rub in the butter but stop when there are still some large flakes. With a knife, stir in the sugar and then three quarters of the buttermilk, mixing until it comes together and using more buttermilk if necessary. It makes a fairly sticky dough. Flour your work surface well, tip out the dough and give a couple of brief kneads then pat to a thickness of 2 to 2.5cm (one inch). Stamp out rounds with a 5cm pastry cutter, trying not to twist the cutter (it makes the towering scones topple) and place on the baking sheet. Brush the tops with milk. Bake in the preheated oven for 10-12 minutes, until the tops are golden. Serve immediately but they also freeze well and can be pepped up by a few minutes in the oven.